I saw fresh young squid at the market and just had to buy some. I made this about a month ago and my husband and I thought it tasted good. Today I decided to make squid tempura again but this time I add them over a bed of mixed greens and herbs from my parents' garden. This salad made a tasty and filling lunch! 1) Mix the water in the flour slowly, use a chopstick to stir lightly. Do not over mix the batter. 2) Add the squid into the batter. 3) Heat the oil in a pot over medium high heat. 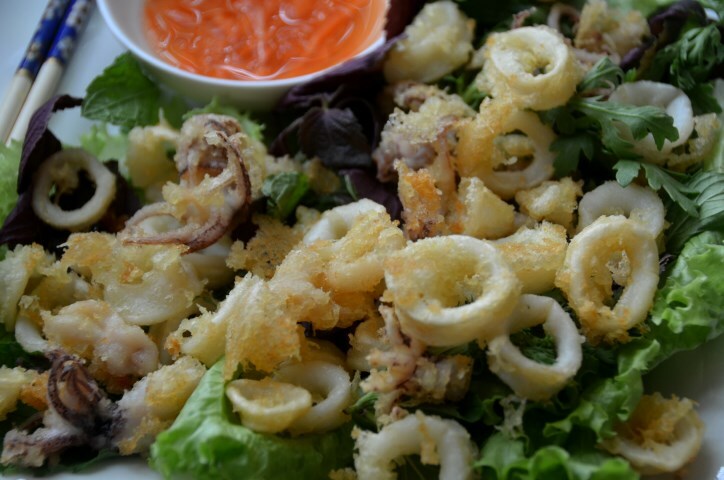 Once the oil is hot, add a little of the battered squid into the pot and fry for about 1 minute or until the batter is light gold. Scoop the squid out onto paper to drain off excess oil. 3) Serve with a mixture of herb and lettuce. Drizzle with or dip in a Vietnamese dipping sauce. *You can make your own batter. 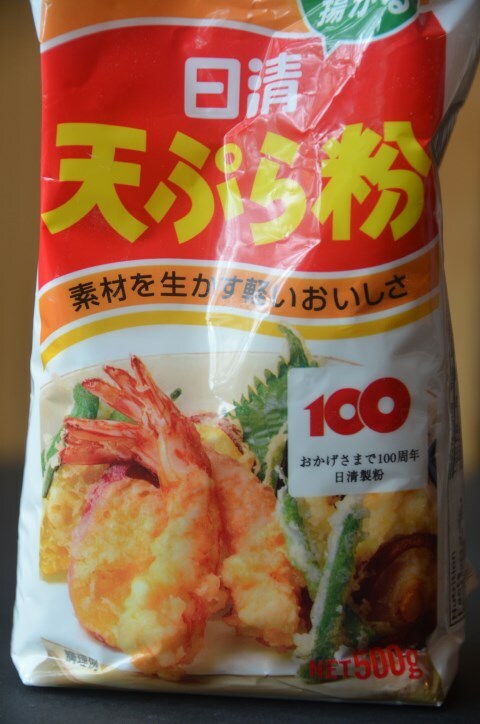 I had a bag of opened tempura flour so I wanted to use it up. This bag is all in Japanese. Fortunately the Japanese word for water is the same as Chinese so I was able to figure out the instruction. Growing up my father made his children learn Chinese after school. I was not a very good student--and probably a disappointment to my father. Somehow I still remember a few simple words and they have come in handy. So, I must thank my father for this! 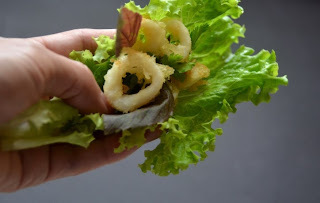 *To test if the oil is hot and ready for cooking; drop in a piece of the battered squid. It will sizzle if the oil is hot enough. If you get no reaction then the oil is not ready for cooking. Once the oil is ready add only a little amount of the battered squid at a time. Avoid over crowding. Adding too much into the pot will cool the oil down and you will end up with soggy fried squid that is saturated with oil. Also, I find that wearing glasses or goggles can help prevent any of the oil splattering into your eyes. Safety comes first when it comes to working in the kitchen! You will not be enjoying your meal if you are injured from cooking.